Have you ever looked up into the open sky and saw some beautiful birds flying by and felt like you want to take a closer look at them? The best place to have this close encounter with birds if you are having vacation in KL is the KL Bird Park. Located smack dab in the middle of the city, the thriving paradise for all bird lovers is opened from 9am to 6pm. It is the world’s largest walk through Bird Park! The bird park is a magical place, especially for children as they walk through the aviary and see birds up close and personal. The park is of course filled with birds who sing almost all day long. The tranquility of the park that is filled with lush greenery is a great place to be in to unwind or just to get away from the hustle and bustle of the city. Many bird species fly freely here as the park was built to make sure that the ecosystem maintains an almost natural environment for the birds and visitors as well. A must see when you are in the park is the Hornbill Park. The park is a living museum that depicts the beautiful tropical rainforest that is a feature of this nation located along the equator. Here, you will also have a chance to see tall trees that replace the metal skyscrapers in the city. Some of the trees here can go as high as 11 storey buildings! The Rhinocerous Hornbill is the largest Hornbill species in the world and the KL Bird Park is proud to be the home of this type of Hornbill. Be enchanted by the beautiful Hill Myna that has a great sense of melody and the many other birds that make the park their home, creating beautiful scenery as they perch atop the green tress and sing almost all day! Visitors are allowed to feed the birds at 11:30am. 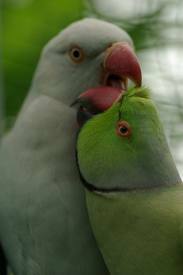 Always heard about Lovebirds but never actually seen one in real life? Well, here’s your chance. The tenants of a particular aviary; the Lovebirds. They got their name because they are…nothing but affectionate love birds. They usually spend most of their time sitting in pairs beside each other. The park is also home to many beautiful colorful parrots that showcase the beauty of their colorful feathers that are unique to each bird. Check out flightless birds, the graceful flamingos that gracefully stand in their ponds and even some oriental birds. One highlight of the park is the place where visitors get to witness the incubation of chicken eggs as well as duck eggs in the bird Nursery. You never know when an egg is about to hatch but hopefully, if you are blessed, you could very well be witness to an egg hatching-live! 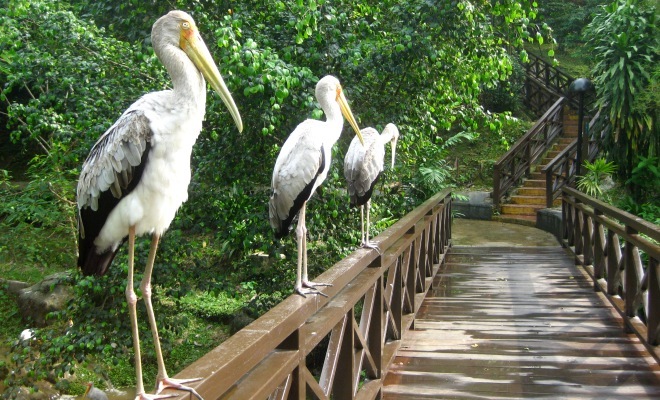 So, whether you are a bird lover or not, the KL bird park is a must-see tourist destination in Malaysia when you are having vacation in the city of Kuala Lumpur!